The 360GT Searchbait™is the ultimate confidence lure that has been designed to fish anywhere by all skill levels. As a searchbait, it allows you to cover more water, uncovering more fish. That is just the beginning. Once you locate fish, there’s no need to switch your presentation. The 360GT Searchbait™ has a natural swimming action fish can’t refuse. Fishing it couldn’t be easier, simply cast it out and reel it in with a steady retrieve. Exclusive VMC® Coastal Black™ hook has extended “leg” on line tie to further enhance action. 60° angle keeps lure swimming in the perfect position. Hang on tight and be ready for action. 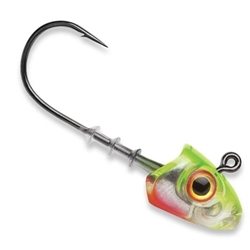 Life-like rattling jig head and body fit precisely with the 3-1/2" body, with color patterns that perfectly match regional forage. This one fishes circles around every other bait.